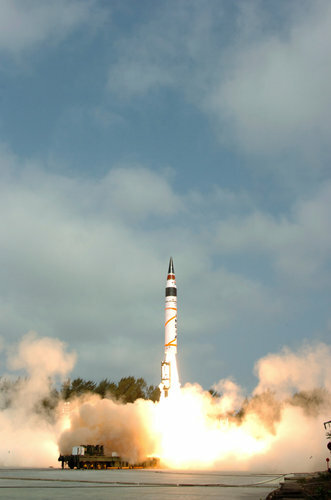 Agni 5 missile launch. Reuters image, via the New York Times. From the New York Times, India has successfully tested an intercontinental ballistic missile with a over 3,000 mile range. Unlike previous Indian missile development, the Agni 5’s extended range makes it clear that the intended target of the missile’s deterrence — and by extension coercion — value is China, not India’s historical nemesis Pakistan. Islamabad must be grinding its teeth: not only is Pakistan having trouble competing with India’s growing technological acumen, the US’s diplomatic shift towards a strong alliance with democratic India illustrates that America views it as a major future power, one worth antagonizing Pakistan to align with. Throughout the Cold War era America and the rest of the world viewed India and Pakistan as something closer to near-peer rivals. Losing the vindication of that near-equal status with its great rival feeds the Pakistani military’s paranoia and is at least partially responsible for the ISI’s support for the Taliban, which it sees as a long-term hedge against Indian encirclement. Now India is publicly demonstrating that it sees its future strategic outlook centered around an adversarial relationship with China, not Pakistan. It’s hard to imagine a greater insult. Given how much that Pakistani military leadership’s motivations are dominated by rivalry with — and fears of — India, this humiliation does not bode well for Pakistan’s cooperation in a future bipolar Asian community dominated by India and China.